Many practices using EMIS Web have poor systems in place to manage referral forms. There may be multiple copies or outdated forms. They are often not correctly converted to capture important data automatically from the clinical record. One solution to this problem is to use third party software that moves referral form management outside of EMIS Web. This often leads to problems with reliability and speed. GPs will quickly disengage with software that isn't intuitive and runs quickly. QToolset Enterprise offers a solution to this problem that is fully integrated into EMIS Web and requires no input from GP practices or CCGs. All referral forms are converted to EMIS Web format by the QMasters team and imported into individual practices with full version control. These forms are maintained by QMasters and updated as required. Where there are local guidelines that are relevant to the referral form an EMIS Web template is also installed to guide the clinician through the consultation and referral process and ensure appropriate data is captured and correctly coded. This coded data is then automatically transferred to the referral form. The quality of data within referrals will improve, GPs will save time, and the number of inappropriate referrals will decrease ​as GPs have easy and fast access to local guidelines. 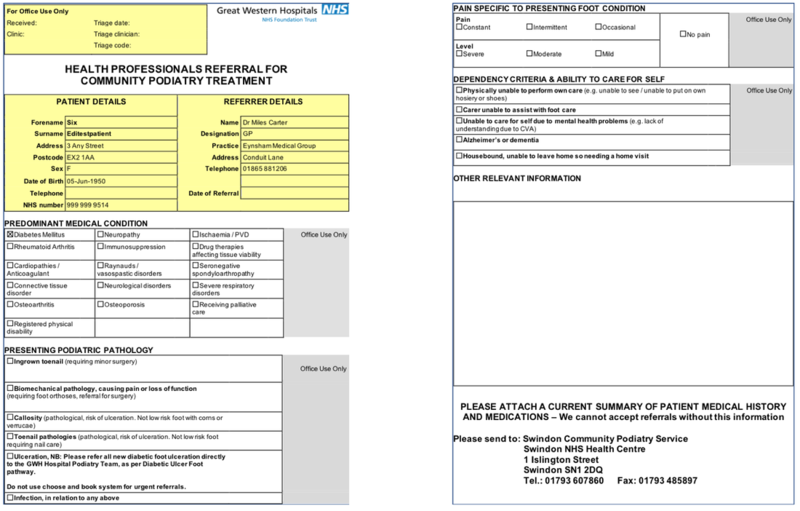 The "Referrals" page of our template lists which referral forms are available to the clinician. The "Management Guidance" page offers links to local guidelines on managing the condition. ​Instructions clearly explain how to make a referral when they feel it is clinically appropriate. Making a referral is a simple process with all referral forms stored directly within EMIS Web. Referral forms auto-populate with clinical data recorded during the consultation. Request the e-Referral in the usual way. When the e-Referral has been made this window appears which allows the user to either search for the form or navigate through the speciality list on the right-hand side. The referral form launches and auto-populates all data from the consultation. This is automatically uploaded to the e-Referral UBRN when it is saved.